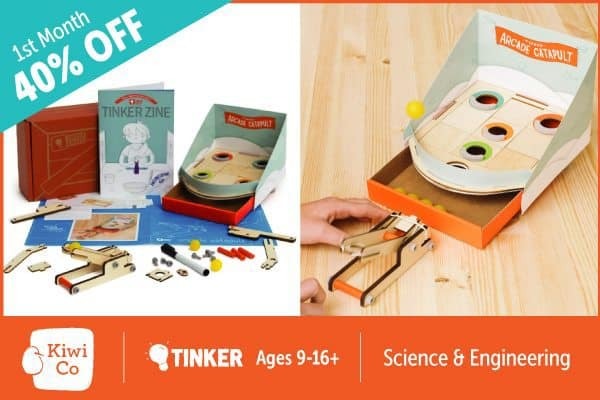 Tinker Crate by KiwiCo is “A Laboratory for Hands-On Experiments Delivered Every Month” and available as a monthly subscription box. The kits are designed for children ages 9-16+. Inside the crate are the components to “explore science, engineering, and technology” and to “inspire young makers with a gift of learning and discovery.” Since STEM (Science, Technology, Engineering, and Math) is being taught in many schools across the country, this is a great way to get young minds interested and having fun while they learn and create. 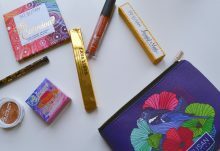 With today’s Tinker Crate review, I’m unboxing the July 2017 Tinker Crate subscription box. The July 2017 Tinker Crate shipment is the Infinity Mirror, and when lighted up, the view appears bottomless–like an endless tunnel of light. 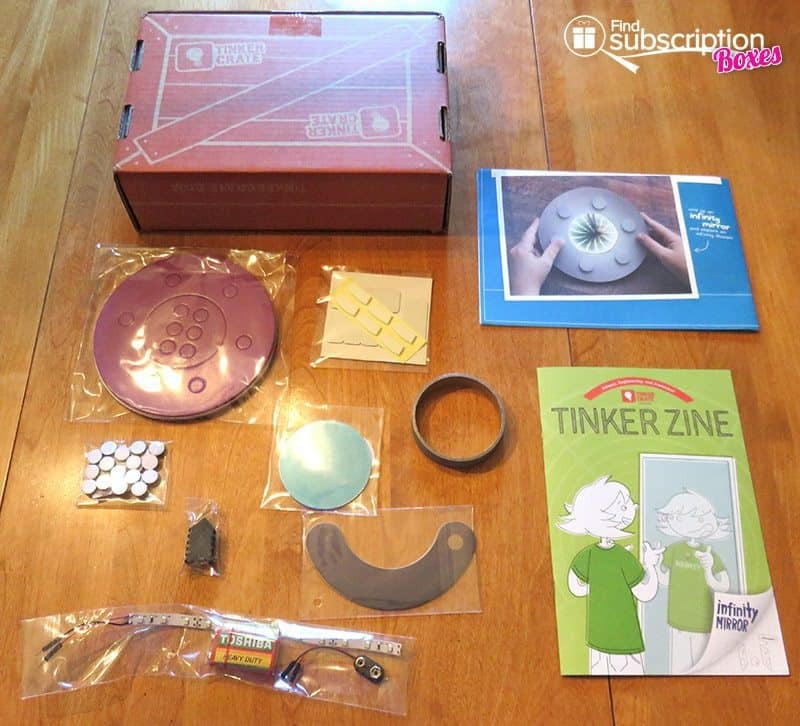 Included in the crate is Tinker Zine, a magazine packed with ideas and other crafts; the instruction sheet which has all the steps on one side, tips and pieces listed on the other; and all the parts and components needed to create the Infinity Mirror. Our builder placed all items out, unwrapped them, and began following the instructions. It came together quickly, and no outside tools are needed. Our builder needed no assistance using the step-by-step instructions. There are video instructions available for those who like to see what to do rather than read directions. Our builder was very happy with the results. He enjoyed building it and was very enthusiastic the whole time—no frustrations. He had fun showing mom what he was doing and how it worked as he assembled it. The website is easy to navigate. The project pieces are sturdy and well-made, and it can be played with over and over. 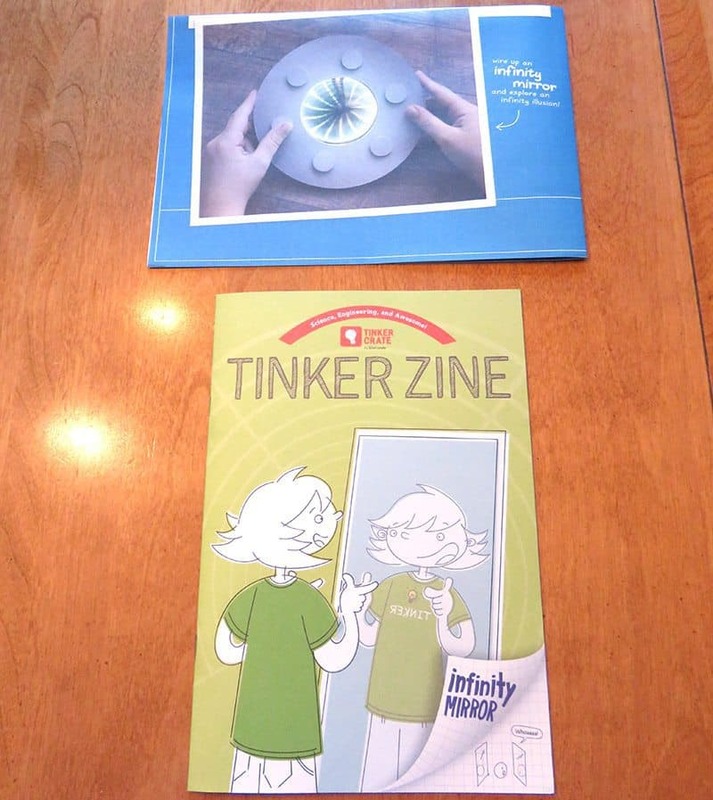 The Tinker Zine has a lot of creative ideas and the science behind the project. It encourages creativity, there’s an optional drawing project related to the Infinity Mirror inside, and a project using the Tinker Crate box plus a few items one would have to purchase. 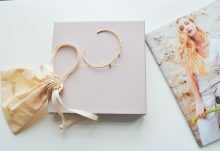 Tinker Crate and the KiwiCo family of subscription boxes have won numerous awards and have been recognized and featured in multiple press platforms. Tinker Crate teaches kids to build STEM projects that are cool! 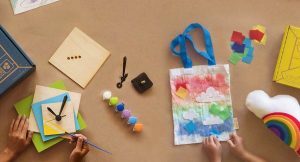 There are monthly, 3, 6, and 12-month Tinker Crate subscription plans available, and longer plans starting at $16.95/month. Use this link to join Tinker Crate today and automatically save 40% off your 1st month – no code needed! 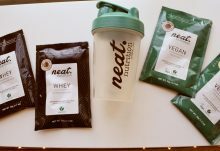 How would you rate Tinker Crate ?